Regarding the whole wheat flour in this tart, you can use virtually any flour you have at home. I often use spelt flour, but I’ve used everything from barley flour to white-whole wheat flour with great success; this is a very, very forgiving recipe. Butter a 9-inch tart pan with 1-inch sides and a removable bottom. Using a food processor fitted with the metal blade, pulse together the cornmeal, flour, and salt. Add the butter and pulse until the mixture resembles coarse meal (alternatively, you can use a pastry blender or your fingers to work the butter into the dry ingredients). Add ice water 1 tablespoon at a time and pulse until the dough starts to look like wet, clumpy sand. It’s ready if a small piece holds together when pressed between your fingers. If it still seems too crumbly, add more water, 1 tablespoon at a time. Turn the dough out into a large bowl and mix in the millet using a fork. Press the dough evenly into the bottom and up the sides of the prepared pan. Chill in the refrigerator for at least 1 hour and up to 1 day. Preheat the oven to 375 F. In a small sauté pan over medium heat, warm the olive oil and sauté the shallots until translucent, about 2-3 minutes. Add the garlic and sauté for an additional 1 minute. Remove from the heat. In a bowl, whisk together the milk, crème fraîche, eggs, capers, dill, salt and pepper. 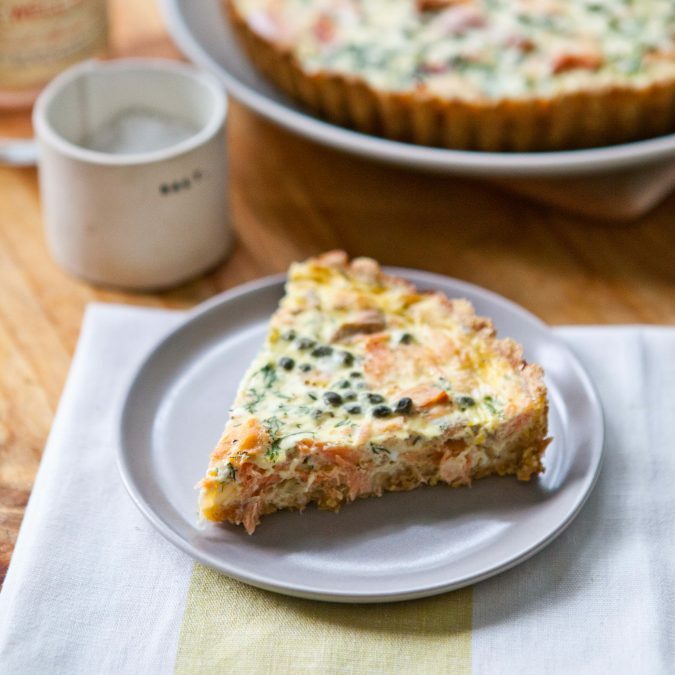 Spoon the shallot mixture in an even layer on the bottom of the crust; arrange the salmon across the top evenly. Pour the custard mixture on top. Bake until the top is golden brown and the filling is set, about 30-35 minutes. Let cool 15-20 minutes. Unmold the tart onto a serving platter and serve warm or at room temperature. Cover and refrigerate leftovers for up to 3 days.